On September 16, 1977 Maria Callas died in Paris at 53. That same day the San Francisco Opera presented a reigning prima donna in an opera based on the life of a legendary French actress who died at an even younger age. 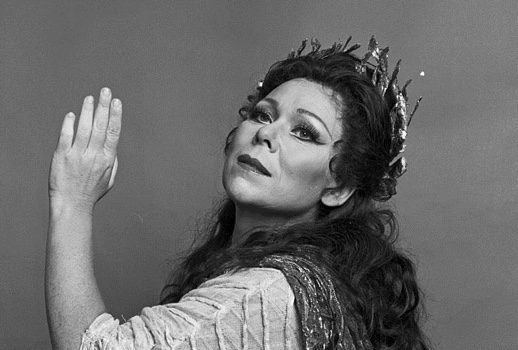 This fascinating confluence prompts “Trove Thursday” to present that performance from 40 years ago: an inspired Renata Scotto as Cilea’s Adriana Lecouvreur with superb colleagues Elena Obraztsova, Giacomo Aragall and Giuseppe Taddei. In addition to Adriana (her first on any stage, I think) and her first US Norma in Cincinnati (can’t believe I didn’t go but I did listen to the live broadcast), 1977 was a banner year for Scotto. She appeared with the Met over 50 times in the house and on tour including her loopy Berthe in Le Prophète, Cio-Cio-San and Leonora in Il Trovatore, the beginning of a ubiquity there which displeased more than a few. Most memorably though she starred that year with Luciano Pavarotti in the first live Met PBS telecast. Not a big lover of La Bohème at the time, I watched it in my dorm room and was destroyed by the end and grateful that my roommate was out studying at the library and didn’t catch me tearstained throughout. Adriana’s been a guilty pleasure of mine since a tape of this broadcast seduced me; it was also the opera in which I saw Scotto for the first time. From the nosebleed seats at the Cincinnati Opera in 1979, she was magical even with a less-than-ideal cast that included Harry Theyard and Beverly Wolff. I hadn’t realized how much Scotto’s interpretation had imprinted on me until I went to see Mirella Freni in Adriana in the 1994 Met production. I’d always been a big Freni fan but there was scarcely a moment the entire evening when I wasn’t missing Scotto. While Freni died beautifully in act IV, she lacked the grandezza, the verbal specificity, the mesmerizing intensity of her near-exact contemporary: they were born just a year and three days apart. Recently a friend was aghast when I ventured that I preferred this performance to the fabled 1959 Naples Madga Olivero-Giulietta Simionato-Franco Corelli-Ettore Bastianini performance. So I re-listened to it and while I’m usually a big Olivero-fan I find her worst mannerisms on display there, and the conducting is as slow and indulgent as the audience is impatient and rowdy. Gianandrea Gavazzeni’s work in San Francisco while exceptionally supportive of his singers also manages a vivid dramatic energy. Cilea’s 1902 masterpiece is based on an 1849 play by Ernest Legouvé and Eugène Scribe, the celebrated librettist of many of Meyerbeer’s grandest operas. Although now virtually ignored compared to the opera, the play, like Victorien Sardou’s Tosca, became a celebrated vehicle for Sarah Bernhardt. There surely aren’t many roles that have been shared among Bernhardt, Joan Crawford who starred in the widely unseen 1928 silent Dream of Love, and Yvonne Printemps, whose Adrienne is the centerpiece of a film by the great Marcel L’Herbier. Nearly 300 years after her death, Lecouvreur continues to fascinate. Twenty years ago Mariusz Trelinksi, director of the Met’s recent Tristan und Isolde, made an intriguing film for Polish television of a pared-down version of the Scribe-Legouvé play. And Cilea’s opera now must be more popular than ever. Anna Netrebko, who sang her first Adriana in St. Petersburg earlier this summer, repeats it in Vienna in November, next year in Baden-Baden and eventually at the Met. During the 2017-18 season Monte Carlo mounts a new staging with Barbara Frittoli and Roberto Alagna while the Angelas Gheorghiu and Meade perform it in Palermo and Frankfurt respectively. Although he’s principally known for Adriana, Cilea did write four other operas including L’Arlesiana which I heard beautifully done by Giuseppe Filianoti, Latonia Moore and Marianne Cornetti with Opera Orchestra of New York ten years ago. Next year Joseph Calleja and Dolora Zajick take on Federico and his mom in concert performances of it in Berlin. Supplementing the recent run of New York City Opera performances of La Fanciulla del West Olivero embodies Minnie in her own inimitable way. Georg Solti has a great time with Falstaff and brings along Katia Ricciarelli, Kathleen Battle, Christa Ludwig, Wolfgang Brendel and Guillermo Sarabia. Thrilling early Mozart happens when Edita Gruberova, Ann Murray, Jill Gomez, Rachel Yakar and Philip Langridge square off in Lucio Silla under Nikolaus Harnoncourt. Adriana and last week’s Attila can be downloaded by clicking on the icon of a square with an arrow pointing downward on the audio player above and the resulting mp3 file will appear in your download directory. More than 90 other “Trove Thursday” podcasts also remain available from iTunes or via any RSS reader.